There are two features that benefit passengers before they step into the cabin. The first feature is the Hands-Free Power Sliding Doors. These doors interact with technology in the key fob. When the chip sends radio waves to a sensor, the doors open automatically. The second feature is found underneath the trunk; it's called the Hand-Free Power Liftgate. This system also has sensor-powered hardware along with a lifting mechanism. The motorized mechanism lifts the trunk door whenever someone's foot hovers directly under a sensor while the key fob is used. If you want to check out these exterior features and other technologies in the cabin, consider taking a test drive. 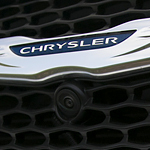 At DARCARS Chrysler Jeep of Waldorf, test drives in Chrysler vehicles are easy to set up. We proudly serve locals in Waldorf and surrounding areas.